Ask fellow campers about "Crystal Lake RV Park" and nearby attractions. The park is older and smaller. It is next to I95 and very easy to get to. Camp site was level with dirt & gravel. Grass area between sites. It had 30-50 amp service and picnic table. Our pull-through was just barely long enough for our 40ft motorhome towing vehicle. There were some small palm trees around the park so able to get satellite service. If you are pulling a vehicle, the hookups are too far back to be easy to connect to. Had to use over 35 feet of sewer hose. Good Sprint and ATT service. We camped at Crystal Lake RV Park in a Motorhome. This campground is small and close to the highway - which makes it easy on and easy off but there is a bit of highway noise that filters into the campground. It is tight and, while most of the roads are asphalt, one of them is actually still dirt. The bathrooms are clean and so is the laundry room. It is an older park but under new management. The front row faces a nice lake. Older and rustic but we would camp here again. We camped at Crystal Lake RV Park in a Motorhome. This is a regular stop for us on our way to and from South Florida. It's nothing fancy, but it's clean and reliable, and the new owner was very pleasant and friendly. Front-row sites overlook a nice little lake. We've never been bothered by noise from I-95, but we're in the habit of running the fan at night. It's easy in and out with good-size pull-throughs. We were surprised this trip at how busy it was and will call ahead next time if it's in season. We camped at Crystal Lake RV Park in a Motorhome. As of April 2013, the park is under new management. The new owners are in the process of renovating the rec hall, updating the facilities, and generally sprucing up everything. The park now is a gem -- level sites and a beautiful lake with fish and wildlife -- so it will be amazing when they get done. The new owners could not have been nicer. It is near a highway, but we never heard noise at night (trees are in between). Our rate reflects the Passport America discount. We camped at Crystal Lake RV Park in a Motorhome. This is an older RV Park, right off the freeway, so very convenient, the Owner was friendly and helpful when we checked in, there is some traffic noise, full hook ups, paved road, grass pads, p/t, big rig access, plenty of space around the RV, space for the towed too, shade trees, pretty view of a small lake, bathrooms and laundry old but clean, small pool, rec room, WiFi. This c/g was such a pleasant surprise, its well cared for, shops, restaurants and plenty of sightseeing are close by, we were only here for one night but would definitely stop here again for a few days. We camped at Crystal Lake RV Park in a Motorhome. We have stayed in this park several times for up to 2 weeks. The sites are grass, level and large, accommodating up to a 40 footer well. It is a real bargain with a Passport discount. 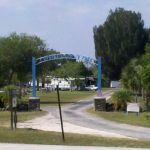 This is a great campground for an overnight stay, right off I-95.This park looks have improved over the years and it has a great atmosphere, and I always feel welcome. I love this park. We would make this a destination park if you want a quiet place with no planned activities. We camped at Crystal Lake RV Park in a Motorhome. Like their website states, this isn't a fancy place but it is well maintained and clean. Everything is very dated, but again, kept quite clean. It is located right next to I-95 so there is a lot of highway noise. There is a gas station at the entrance to the campground which is convenient for small essentials such as drinks, but it's not a grocery store by any means. Otherwise, this campground isn't near anything. 15-20 minute drive to the nearest Wal-Mart or Publix. The rec room and bath house/laundry are not air conditioned which was quite uncomfortable for FL in July. The owners are friendly and visible. Small pool but again clean, rec room had a pool table, ping pong, books, etc. My kids enjoyed it, other than it being very warm in there. This is a good spot for an overnight while driving through FL or brief stays. We were in town to see the last shuttle go up. The campground is about 30-40 minutes from the space center and about the same from some nice beaches. Bring the bug spray! We camped at Crystal Lake RV Park in a Tent Trailer. Too near the interstate to be considered quiet. Lots of noise from there. Owner was very unfriendly. Staff seemed helpful, provided good info upon arrival. Would NOT stay here again. We camped at Crystal Lake RV Park in a Fifth Wheel. We spent eight nights here during Daytona's Bike Week. Lots of riders in the park but no wild partying. Other than a little interstate noise, it was quiet. We were parked across from the lake and loved watching the herons and cranes. Staff was very helpful and the only downside was being a bit far away from any stores and restaurants: which sometimes is a good thing. We camped at Crystal Lake RV Park in a Fifth Wheel. We spent 3 days and found the staff to be friendly and helpful. This RV Park is close to the Interstate, but we didn't notice any excess highway noise. Will stay here again when we are in the area. Rate was Passport America. We camped at Crystal Lake RV Park in a Motorhome. OK park. Staff is not very helpful. We stayed there a week. Wi-Fi is very poor; television received 7 channels of poor reception. The park is selling to year round campers now who are building decks and tiki bars and whatever else they have the urge to build. We had to listen to saws and hammering non stop over the weekend. Lucky we had the weekend to relax. The park is not within walking distance to anything. Every rule written was broken; aggressive dogs, unregistered guests who parked their cars in other sites. It's a shame; this could be a nice place with a little work. We camped at Crystal Lake RV Park in a Motorhome. Fairly nice Campground, but in the middle of nowhere. Closest restaurant about 10 miles away. the site we had was a little small for our coach. Wi-Fi is an additional charge. Large dog in the office which is a little intimidating. Owners may not realize the odor caused by the dog. With a little work, this could be a much better park. We camped at Crystal Lake RV Park in a Motorhome. We stopped at Crystal Lake RV park on our way home from Florida to Kentucky. What a sweet campground. Even though it was hot in Florida the campground has a wooded surround with a little lake. Everything was clean and the staff was very helpful. We will make this our pit stop on future trips to Florida. We camped at Crystal Lake RV Park in a Motorhome. Love this place...clean, nice and helpful owners, close to Daytona, Titusville & Orlando. Lots of birds to view on the lake and alligators. Seen a turtle and lizard. The weather here is great. The US-1 is not far to take instead of the Interstate 95. Merrit island is great for doing bird watching. The only thing heard from others that is a negative is...I-95 noise. We don't mind it at all. Not many bugs...could stay forever... We camped at Crystal Lake RV Park in a Motorhome. Are you affiliated with Crystal Lake RV Park ?